Since the Winterthur pitch was relocated last year we've had a torrid time trying to get an even bounce out of the pitch. The new position is excellent and achieved exactly what we expected. But it turns out when relocating the pitch, we were forced to dispense with the padding/underlay. 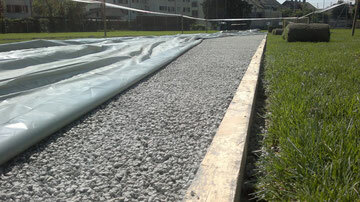 The matting was instead laid directly on top of the hard base, with a layer of sand in an effort to achieve an even bounce. But this didn't produce the required result, so at a meeting held at the Sportamt in Winterthur on Wednesday 26th February 2014, the Sportamt, Cricket & contractor reached the conclusion that Winterthur needs a new pitch. A quote has been requested from Notts Sports which is expect to arrive in early March. Meanwhile, clarification is underway on the best way to fix the new mat to the surface (nails, adhesive or sand), also whether a layer of concrete would be better than the current surface (with specific reference to Zuoz & Cossonay). Costs are being compiled now. How these costs are divided is yet to be decided. 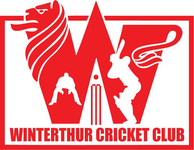 Given the City of Winterthur's present financial situation cricket is likely to have to share in some of the costs. The plan is to have the work completed by the end of March/1st week in April.